Provides a comfortable seating surface for bathing or showering. Vinyl Seat and back are padded with 1 1-4in open-cell foam for comfort. Durable 1" anodized aluminum frame will not rust. Nine (9) height adjustments in " increments. Non-marring, non-slip rubber tips. Invacare shower chairs provide a comfortable seating surface for bathing or showering. They were designed for individuals who require more support than that provided by a bath board. 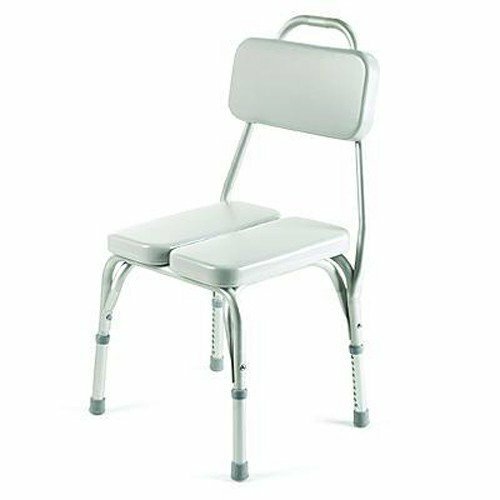 If you have low endurance, or difficulty standing in the shower or tub, our shower chairs will provide you with a safe way of bathing. They are designed for individuals who require seating support when bathing or showering, and fit in virtually any standard tub or shower. Invacare shower chairs provide comfort and safety in the bathtub. What is the smallest width of this chair? The smallest width on the chair is the seat width. It measures at 15.5 inches. Can the back of this chair be removed and used as a stool? The back of the chair is not removable. What is the weight limit for this chair? What is the side-to-side width of this chair? Weight capacity is 250 pounds. The space between the farthest two points is 16.25 inches. What is the range of the adjustable seat height? Will the seat top get to 24" high? The adjustable height varies from 17-22 inches and can be adjusted in 1/2-inch increments, according to the manufacturer. This shower chair has not been used yet. Original order was over a month ago. Was sent a damaged chair (punctures in the back cushion). Was told to leave chair in original packaging on my front porch. It sat there for almost two weeks. Could not get a reply from the customer service rep as to why it was taking so long to pick up. Did not get sent a replacement chair in the meantime. Called and spoke to another customer service rep. She apologized and said the shipping department "dropped the ball" on sending another chair and getting the damaged one picked up. They immediately sent me another chair, which was also damaged. I reported it, and was told they could send me another chair. I responded that I would like another chair if they would inspect it first, and package it in a way that it would not move around in the box it was shipped in. I have not gotten a response. Good product, good price, fast delivery. Buy this with a grab bar and you can feel safe in your bath again!